All the above styles are offered to students of any level and age. We encourage diversity of repertoire which helps students maintain focus, fun and long term personal fulfillment. 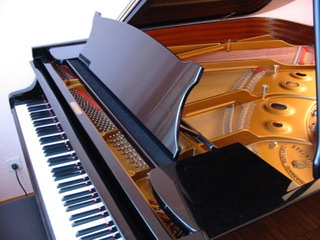 Finger technique is essential for the aspiring pianist to attain a level of dexterity and flexibility necessary to perform easy or advanced music. In the weekly lesson plan, students are presented a set of Finger Technique exercises which are practiced in an organized and progressive way to develop the student’s ability to express musically. We use a selection of proven piano methods to develop the student’s capacity to identify notes on the music staff. Children are presented with a progressive reading lesson plan to allow them the freedom to read Classical, Jazz or Film Music easily and with confidence. Our instructors love to expose their students to a diverse repertoire covering all styles of the music spectrum. From Beethoven’s “Moonlight Sonata” to the music of Scott Joplin and John Williams, we have available to all students a diverse piano repertoire in all styles arranged for beginner, intermediate and advanced levels. Our curriculum is based on our own “Applied Harmony” piano method which we have carefully developed over the last 30 years of instruction. The “Applied Harmony” piano method allows students to master the building blocks of music through the study of chords. Through that method students are positioned to play any music in any style and understand the piece they play from a compositional stand point. This approach empowers students and helps them perform Mozart, Lennon/McCartney songs or Jazz with more insight, understanding and musicality. Our own “Applied Harmony” piano method is at the core of the study of Songwriter Piano Arranging. From that method the student is led in progressive steps through the mastery of left hand accompaniment and right hand melodic harmonization. The student develops a “spontaneous approach” to playing piano arrangement in a pop, country, gospel and jazz styles. Over the years we have successfully prepared many students to college music programs and high school for the arts entrance exams. Our instructors are happy to go over schools requirements and devise a plan to ensure that the student is ready for the music institution’s entry exam.